Why have only one New Year when you can celebrate two? That's the logic behind a bizarre Scottish fire festival, the Burning of the Clavie. Scotland has dozens of fire festivals and celebrations around Hogmanay - the multi-day New Year's celebration that's a Scottish tradition. But in Burghead, a village near Elgin in Moray, northeast Scotland, they go one better. They follow all the Hogmanay celebrations at the beginning of the month with second New Year's fire ritual on January 11. On that night, the clavie, a half barrel filled with wood shavings, tar and barrel staves, is nailed to a post (some say that the same nail is used, year after year) and then carried to the home of one of the town's oldest residents, the Burghead Provost. He sets it ablaze with peat from his own hearth. An elected Clavie King, along with several other men - usually fishermen - carry the burning clavie clockwise around the town, stopping now and then to present smoldering embers to various householders. Finally, the clavie is carried up to an ancient altar in the remains of a Pictish a stone fort on Doorie Hill. More fuel is added and as the clavie breaks up, embers tumble down the hill. Onlookers grab embers to light New Year's fires in their homes for luck. Nobody knows how it started or why it started. It clearly has pagan origins - so much so that in the 18th century, churchmen tried to stamp it out. They called it "an abominable, heathenish practice". It's probable that before that, the event was more widespread around Scotland. 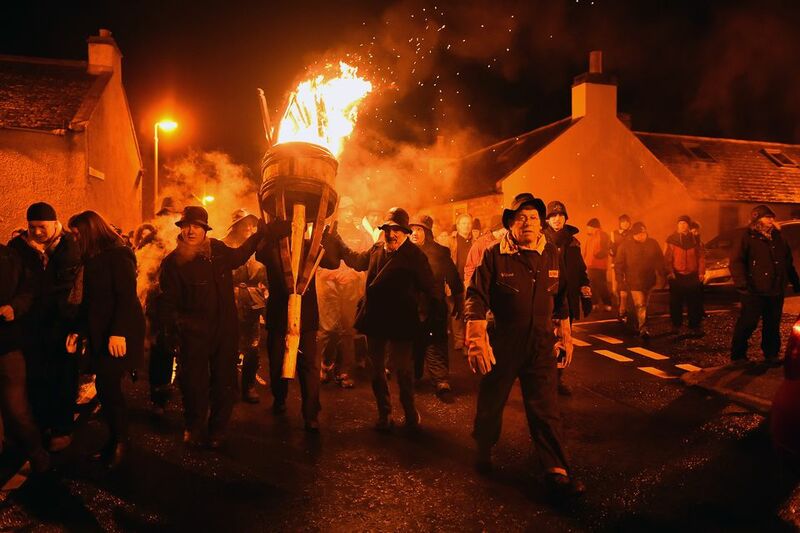 Now, one of Scotland's oldest and strangest fire celebrations only clings on in Burghead. No one knows when it began or what exactly it means. Some believe the word comes from cliabh (clee-av), a Gaelic word for a wicker basket, creel or cage. Others say it comes from the Latin word clavus and is Roman in origin. But since no one is sure whether this event is Celtic, Pictish or Roman in origin, the origin of the word itself is a mystery. Those who have witnessed the Burning of the Clavie say that the final blaze, which can cover the whole of Doorie Hill, bears a spooky resemblance to the end of the cult film The Wicker Man. However, this being modern Scotland, a rousing good time is naturally had by all. The Catholic Church adopted the Gregorian Calendar in the mid 16th century, but it was nearly 200 years later, around 1752, before the new calendar was finally adopted across Britain. The Scots didn't like it because 11 days simply vanished with its adoption. There were riots across the country, particularly in Scotland, as people chanted, for the return of the 11 days. In Burghead, they had a better idea. They just celebrated the New Year all over again on January 11. Grabbing a piece of the burning, or burnt out clavie is meant to bring good luck and some people even send bits to their relatives overseas. If you are thinking of witnessing this spectacle, make your way to Burghead by about 6 pm on January 11. It's a small village and any local will be able to point you in the right direction. If you want a better idea of what we're talking about, watch this award winning video about the Burning of the Clavie.